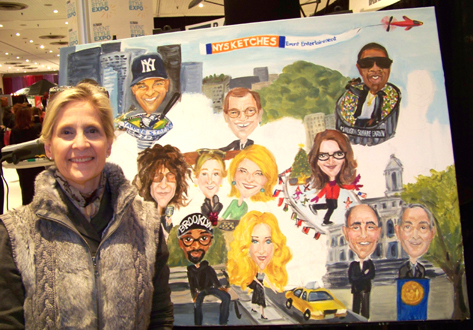 This week, NYSketches had a booth at the BizBash Event Style Show. 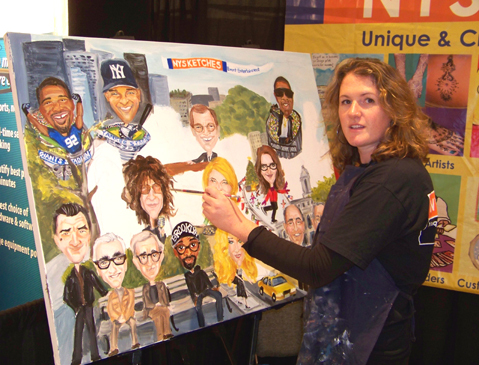 We showcased our services, and created an Event Mural, of notable New Yorkers. Event attendees could have their portraits quickly painted next to their favorite celebrity. One guest, who is known for her packaging business, asked to be painted next to Martha Stewart. See her with her beautifully wrapped package below. Other celebrity New Yorkers painted in the mural: Robert DeNiro, Martin Scorcese, Woody Allen, Spike Lee, Michael Strahan, Derek Jeter, David Letterman, Howard Stern, Sarah Jessica Parker, Tina Fey, Jay Z, Rudy Guiliani, and Michael Bloomberg. Entry filed under: caricatures, event mural, marketing events, tradeshow. Tags: corporate event entertainment, event mural, marketing event, tradeshow.